A world-renowned Love Design® and elite matchmaking firm that builds and remodels the love lives of the world’s most prominent and successful singles, married couples and families from hometown to Hollywood including celebrities, politicians, and CEO’s. Love Architects Founder Kailen Rosenberg alongside Oprah Winfrey, starred as the lead matchmaker, life coach and Oprah’s Love Ambassador in the award-winning series, “Lovetown, USA” on OWN; Oprah Winfrey Network. Kailen has also been called upon to share her insight into family and love on BBC Worldwide, E!’s Stewart’s & Hamilton’s, and The Kardashian’s. 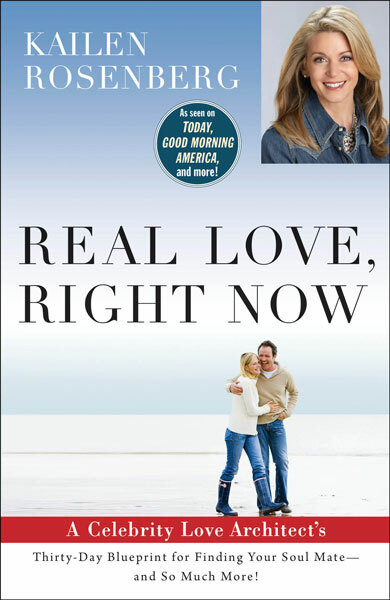 She’s a regular and expert contributor on the topic of love, and has been featured in more than 1,000 print, online, radio and television interviews. Once you see Kailen, you’ll understand why the Oprah Winfrey Network and other important media look to Kailen for answers on how to find and build real love. She is truly a Love Intuitive. Kailen wrote the definitive book that’s changing the way the world finds and experiences authentic love. In Real Love, Right Now, Kailen presents a step-by-step 30-day plan that prepares you for a true, healthy and loving relationship. Through honest physical, mental and emotional self-appraisals, you’ll be able to identify the things that may have held you back. This invaluable knowledge helps you re-set the course for finding and experiencing the kind of love you want and deserve. Passionate about love and how it can build a better world, we are committed to helping successful individuals find the authentic love they deserve. This has been our core purpose for more than 25 years. Love Architects® by Kailen is an elite matchmaking and Love Design firm founded by Kailen Rosenberg, one of the most sought-after love experts, authors and celebrity matchmakers in the world. Our clients are captivating, intelligent, highly successful single women who have created abundance in their lives — exceptional women who have it all, except for one thing they truly desire — an extraordinary, soulful man, who like them, is ready for lasting love. While the Love Architects by Kailen has an unparalleled database of successful, eligible bachelors, giving us an enviable success rate that our competition can only dream about, we also represent extraordinary single men, who like their women counterparts, come to us looking for their perfect love-mate. Aspen | Atlanta | Bellevue | Beverly Hills | Big Sky | Boca Raton | Boston | Charleston | Chicago | Dallas | Greenwich | Houston | La Jolla | London | Los Angeles | Malibu | Minneapolis/St. Paul | Naples | Nashville | New York| Orlando | Palm Springs | Park City | Portland | Rochester-Mayo | San Diego | San Francisco | Santa Barbara | Scottsdale | Seattle | Washington D.C.